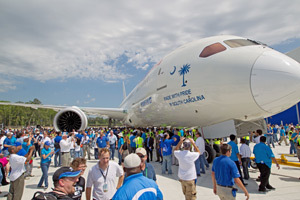 South Carolina is going to be on the receiving end of more work from Boeing, responsible for designing 777X engine components and design and assembly work on the 737 MAX. Wichita’s Spirit AeroSystems Inc will build the 777X engine components while Boeing’s propulsion center in North Charleston, S.C. will handle the 737 MAX work. Design and assembly of the 737 MAX engine nacelle inlet and the design of the 737 MAX engine nacelle fan cowl will be done exclusively at the South Carolina site. Wichita’s Spirit AeroSystems will build the engine nacelle for the 777X upon the design’s completion.